The Art of Naming: 5 Rarely Used Greek Boy Names! Once again, a couple of the polls on the side of the blog have ended and the results are in! You voted! The winner of the poll was Apollo! 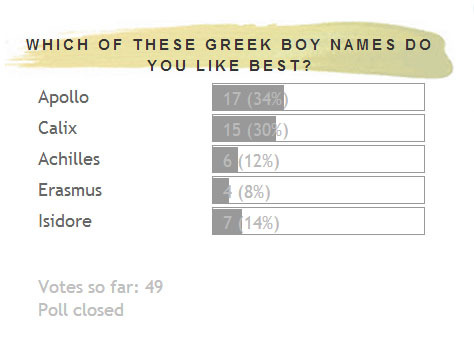 Apollo is a Greek mythology name. He was the son of Zeus and the god of medicine, music and poetry. Modern associations include NASA's Apollo program that landed humans on the moon; the historic Apollo Theatre in New York that launched the careers of many famous musicians. Apollo ranked within the Top 1000 for the very first time at #993 in 2012! This name has only ranked in the US since 1965. Calix is a handsome and rare choice. Some think of it as the male form of Calixta/Calista. It is a Greek name meaning "Very Handsome" but some associate it with a Chalice in Latin. It has only been used in the US since 2002. There were 46 boys given the name in 2012, but it only ranks at #2619. Isidore was a common name in ancient Greece and is held by several saints. The name means "Gift of Isis" and was readily used by Jews in Spain. St. Isidore of Seville worked as an encyclopedist and helped to pass down much of our knowledge about medieval times. This name was most popular from 1912-1924. Since then, usage has nearly stopped. Only 5 boys bore this name in 2012. Achilles was a great warrior in Greek legend and one of the stars of Homer's Illiad which featured the Greek war against the Trojans. He was famously killed by an arrow to the heel, (now called the Achilles tendon) as it was his only weak spot. Because of this, the name possibly means "pain" but the true meaning is unclear. Achilles is used more in Europe than in the states. It's been used ocassionally since 1912, and had a small boost in 2005. There were 146 boys born in 2012 with this name, ranking at #1209. Erasmus is a very rare name but it shouldn't be. It is Greek for "beloved, desired" which is very attractive! Perhaps its the two S's in the name that makes it difficult to say. Saint Erasmus was also known as Saint Elmo. And Charles Darwin's grandfather was named Erasmus. This name briefly ranked in the US from 1880-1882. It wasn't used again until 1913-1926, 1942, 1970, 1972, 2000, and 2010-2011. There have only been 105 Erasmus' born in the US since 1880. I'd like to see Erasmus and Isidore have more usage for modern boys. Which do you like?